Why do I have it? Honestly? It’s sort of embarassing, but I thought the actor pictured in Naida’s post about Captain Wentworth was too cute not to see the movie… and so I Netflixed the movie, and then had to read the book. Plus, I needed something very different but equally good after listening to the Tiffany Aching books. in this case, it’s tied. Summary: When Anne Elliot was nineteen, she was in love with a young naval officer named Frederick Wentworth, but was talked out of it as being an imprudent match by friends and family. Now, eight years later, she is still unmarried, and still in love with Frederick – who is now Captain Wentworth, recently returned to shore with the large fortune he made in the war, and looking to settle down. When they are forced back into each other’s company, things are strained between them, and she fears that by her earlier weakness, she has lost him forever. For how can they overcome eight years of heartbreak and regret to be together once more? 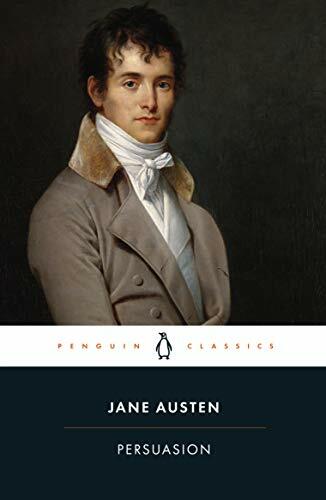 Review: I always feel like a bit of a fraud reviewing Austen, or any classic, since so much has been written about it already – who cares about my opinion when many generations of masters theses have been written on the book by people better educated than me? Especially when I’ve decided my optimal pattern for reading, understanding, and enjoying the classics is as follows: Step 1: Rent and watch at least one movie adaptation of the book, so that I have at least some idea of the major plot points, as well as faces to put to the multitudes of tertiary characters. Step 2: Listen to the audiobook, so that someone else can deal with the long, convoluted sentences, as I’ve found that with any non-modern writing style, the meaning has a better chance of getting from my ears to my brain than it does from my eyes to my brain. Step 3 (optional): Watch another adaptation (or re-watch the same one, if the leading man was cute. Heh. ), and look for what they cut/changed. So, that was my general pattern here, and I have to say, it worked well. I thoroughly enjoyed Persuasion, perhaps not quite so much as Pride and Prejudice, but certainly more than Emma. (I read Sense and Sensibility so long ago, and without the benefit of having seen the movie first, that I really can’t compare it.) Persuasion‘s a more mature, sober book, less sparkly and quick-witted, but still an effective send-up of class, vanity, social climbing, and the strictures of society… plus it’s one heck of a compelling romance. Anne Elliot, while not a particularly lively heroine, was immensely sympathetic. First, being a unmarried lady of eight-and-twenty myself, I was rather predisposed to identify with her (although I got somewhat tired of hearing about how her – and by extension, my – bloom of youthful attractiveness was in danger of disappearing at any second and therefore she’d never get married and her life would have no meaning.) I also think that most people have, if not a long-lost love that they look upon with regret, at least someone in their past that they look on with nostalgia, and a hint of “what if…”, and that makes Anne’s plight recognizable and relatable. Finally, I’ve long acknowledged my inordinate fondness for boys on boats (“Sometimes you’re just in the mood for the British Navy.”), so Captain Wentworth is an eminently swoon-worthy leading man. There are two things that I did wish were a little different. First, there’s no secondary romance involving sympathetic characters. Anne’s story is enough to fill the pages, but in the other Austen I’ve read, there is a secondary couple who deserves (and of course gets) their happy ending. In Persuasion, Anne’s not surrounded by any other particularly sympathetic young people, and so there’s no other couple to root for. (Certainly no one to equal, say, Jane and Bingham from Pride and Prejudice.) My only other quibble with the book is that the pivotal scene at the end of the book is mostly lacking in dialogue, choosing instead to have the narrator explain to us how Anne and Frederick made up without actually letting us hear it. That’s a shame, because Austen can certainly write wonderful dialogue, and by not including it at the end, it felt like we were being kept at a distance from the most important part of the story. Still, overall I thought this was a wonderful book, and most definitely one I will return to. 4.5 out of 5 stars. Recommendation: Oh, c’mon. It’s Austen, it’s a classic, it’s not as intimidating as you might think, and it’s a wonderful story of love and faithfulness and hope in the face of all seeming lost. Read it, if you haven’t already. First Line: Sir Walter Elliot, of Kellynch-hall, in Somersetshire, was a man who, for his own amusement, never took up any book but the Baronetage; there he found occupation for an idle hour, and consolation in a distressed one; there his faculties were roused into admiration and respect, by contemplating the limited remnant of the earliest patents; there any unwelcome sensations, arising from domestic affairs, changed naturally into pity and contempt. Your review is great – I know how you feel when it’s time to approach the classics. I read a classic short story recently and I was glad I had my son (he’s an English major) to discuss it with when I was done. Great review, I am hoping to read this book soon. I love your method of approaching the classics! I may have to give that a go. I have to read see the movie before I read the book or the movie is just ruined for me by their inexplicable casting choices. Speaking of casting choices, have you ever watched MI-5? Capt Wentworth plays Adam, replacing Tom (Mr Darcy). I have to tell you, that was weird watching both of those after MI-5. Desert Rose – Thank you! Alaine – I’d definitely recommend it – I’m trying to space out my Austen, but it’s hard… I want more right away! Carrie – I haven’t seen or heard of MI-5 (although when I went to check it out, Netflix tells me that I will absolutely love it), so now I’m going to have to! Persuasion is my favorite — even over Pride and Prejudice, though I love that one as well. 3m – It does contain one of the best love letters I’ve ever read, for sure!